Cat & Mouse Trivia - Does anyone remember the cat & mouse duo?...Tom & Jerry, a cat & mouse series of animated theatrical shorts, created by Hanna & Barbera. The original cartoon series aired between the 40's & 50's & is notable for having won the Academy Awards for best Short Subject Cartoons seven times! "Cat & mouse, often expressed as cat-and-mouse game, is an English-language idiom dating back to 1675 that means "a contrived action involving constant pursuit, near captures, & repeated escapes. The 'cat' is unable to secure a definitive victory over the 'mouse,' who despite not being able to defeat the cat, is himself too nimble to be caught. In extreme cases, the idiom may imply that the contest is never-ending." 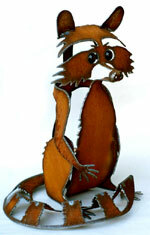 A full-time artist living in Arizona, Henry Dupere ia a skilled & passionate metal sculptor. His imagination, sense of humor, & love of nature are expressed inhis unique rusted metal garden sculptures! All of the garden art sculptures in the Dupere collection can be used to add a touch of distinction to any garden or home decor. 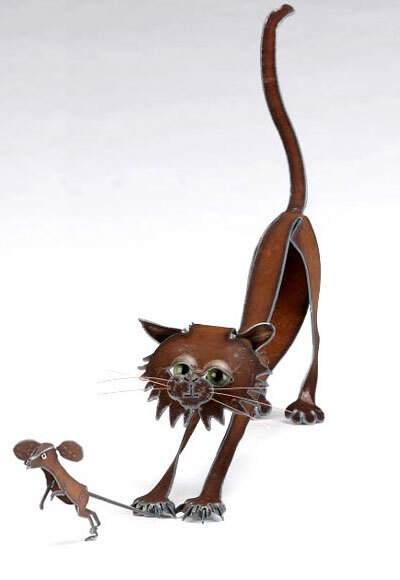 Henry Dupere Cat & Mouse Rusted Metal Garden Sculpture. Size: Cat - 21" long by 19" high at tail by 6 1/2" wide. Mouse 5-1/2" tall by 12" long by 2-1/2 " wide. Three-dimensional rusted metal Cat & Mouse garden sculpture.